"Sea bag" redirects here. For the type of luggage, see Duffel bag. This article is about the clade of gastropod molluscs. For the similarly named clade of extinct jawless fishes, see Anaspida. For the informal group of reptiles, see Anapsida. For the freshwater crustacean family, see Anaspididae. The clade Anaspidea, commonly known as sea hares (Aplysia species and related genera), are medium-sized to very large opisthobranch gastropod molluscs with a soft internal shell made of protein. These are marine gastropod molluscs in the superfamilies Aplysioidea and Akeroidea. The common name "sea hare" is direct translation from Latin lepus marinus, as the animal's existence was known in Roman times. The name derives from their rounded shape and from the two long rhinophores that project upwards from their heads and that somewhat resemble the ears of a hare. Many older textbooks and websites refer to this suborder as Anaspidea. The original author Paul Henri Fischer described the taxon Anaspidea at unspecified rank above family. In 1925 Johannes Thiele established the taxon Anaspidea as a suborder. Since the taxon Anaspidea was not based on an existing genus, this name is no longer available according to the rules of the ICZN. Anaspidea has been replaced in the new Taxonomy of the Gastropoda (Bouchet & Rocroi, 2005) by the clade Aplysiomorpha. The scientific name for the order in which they used to be classified, the Anaspidea, is derived from the Greek for "without a shield" and refers to the lack of the characteristic head shield found in the cephalaspidean opisthobranchs. Many anaspideans have only a thin, internal and much-reduced shell with a small mantle cavity; some have no shell at all. All species have a radula and gizzard plates. Jörger et al. (2010) have moved this taxon (named as Anaspidea) to Euopisthobranchia. The name Aplysiomorpha was preferred by Bouchet & Rocroi (2005) over Anaspidea Fischer, 1883, but the authors now agree that there is a consistent usage for Anaspidea in the recent literature and that the older name must be preferred. Sea hares are mostly rather large, bulky creatures when adults. Juveniles are mainly unobserved on the shoreline. The biggest species, Aplysia vaccaria, can reach a length of 75 centimetres (30 in) and a weight of 14 kilograms (31 lb) and is arguably the largest gastropod species. Sea hares have soft bodies with an internal shell, and like all opistobranch molluscs, they are hermaphroditic. Unlike many other gastropods, they are more or less bilaterally symmetrical in their external appearance. The foot has lateral projections, or "parapodia". Sea hares are herbivorous, and are typically found on seaweed in shallow water. Some young sea hares seemingly are capable of burrowing in soft sediment, leaving only their rhinophores and mantle opening showing. Sea hares have an extremely good sense of smell. They can follow even the faintest scent using their rhinophores, which are extremely sensitive chemoreceptors. Their color corresponds with the color of the seaweed they eat: red sea hares have been feeding on red seaweed. This camouflages them from predators. 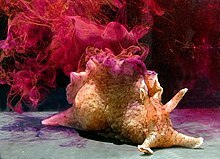 When disturbed, a sea hare can release ink from its ink glands, providing a fluid, smoke-like toxic screen, adversely affecting its predators' olfactory senses while acting as a powerful deterrent. The toxic ink may be white, purple, or red, depending on the pigments in their seaweed food source and lightens in color as it spreads, diluted by seawater. Their skin contains a similar toxin that renders sea hares largely inedible to many predators. In addition to the colored ink, sea hares can secrete a clear slime akin to that released defensively by hagfish which physically plugs the olfactory receptors of predators like lobsters. Some sea hares can employ jet propulsion as a locomotion and others move like a stingray but with greater fluttering fluidity in their jelly-like "wings". In the moving marine environment and without the sophisticated cognitive machinery of the cephalopods, their motion appears to be somewhat erratic, but they do reach their goals, such as the seabed, according to the wave-action, currents, or calmness of their area. Sea hares are eaten. Called Chinese: 酱爆海兔; literally: 'sauce-fried sea hare' (pinyin=jiàng bào hǎi tù) in China, sea hares are typically quick fried in a sauce. In Hawaii, sea hares or kualakai were typically cooked in an imu wrapped in ti leaves. Aplysia californica is a typical example of a sea hare, and is noteworthy for its usefulness in studies of neurobiology because of the unusually large size of the axons that are a part of its nerve cells. See Aplysia gill and siphon withdrawal reflex. Sea hares are often used as a method of eradicating nuisance algae and cyanobacteria ("red slime algae") in reef aquaria. The hares usually do an excellent job, but when they have eaten all of the algae and cyanobacteria, they often shrink from starvation and eventually starve to death. Many reef-keeping clubs have started programs where groups of hobbyists "share" a single sea hare among a large group. ^ Fischer, P. (1883). Manuel de conchyliologie et de paléontologie conchyliologique fasc. 6. Paris: Savy. pp. 513–608. ^ Jörger, K. M.; Stöger, I.; Kano, Y.; Fukuda, H.; Knebelsberger, T.; Schrödl, M. (2010). "On the origin of Acochlidia and other enigmatic euthyneuran gastropods, with implications for the systematics of Heterobranchia". BMC Evolutionary Biology. 10 (1): 323. doi:10.1186/1471-2148-10-323. PMC 3087543. ^ P.I., jurisdiction=New South Wales; corporateName=Australian Museum; author=Rudman, W.B., Firminger (15 July 2010). "The Sea Slug Forum - Aplysia vaccaria". www.seaslugforum.net. ^ Ceurstemont, Sandrine (2013-03-28). "New Scientist TV: Sea hares use sticky weapon to cripple predators". Retrieved 2016-09-30. ^ Peterson, Coyote (2016-09-30). "Inked by a Giant Slug! - YouTube". Retrieved 2016-09-30. ^ Packard, A. (1972). "Cephalopods and Fish: the Limits of Convergence". Biological Reviews. 47 (2): 241–307. doi:10.1111/j.1469-185X.1972.tb00975.x. ^ For details of locomotion in the Aplysiomorpha, see Bebbington; Hughes (1973). "Locomotion in Aplysia (Gastropoda, Opisthobranchia)". Journal of Molluscan Studies. 40 (5): 399–405. doi:10.1093/oxfordjournals.mollus.a065237. Wikimedia Commons has media related to Anaspidea.